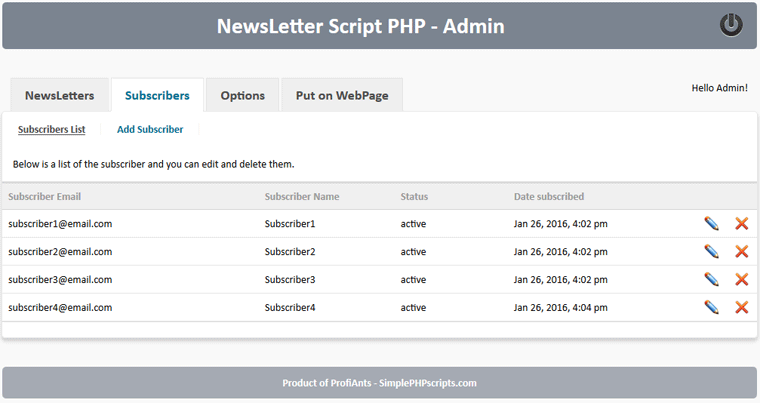 How to install, setup and use NewsLetter Script PHP? 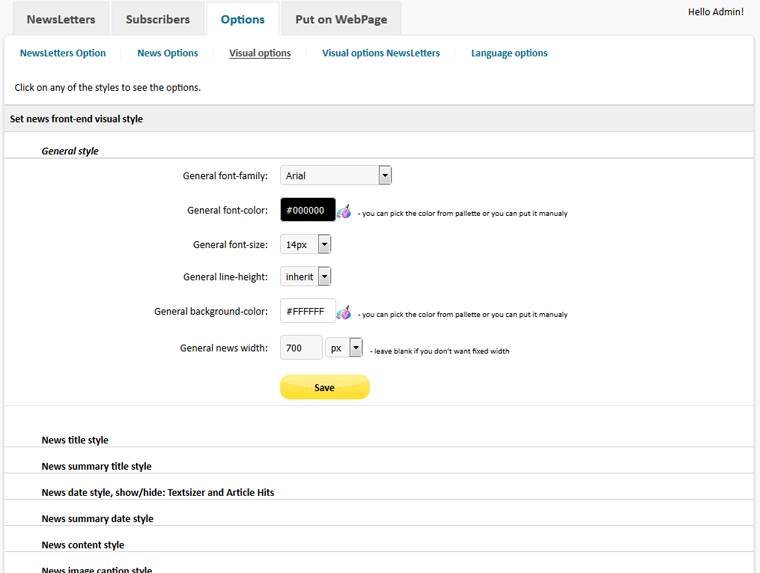 CSS styling and language options. 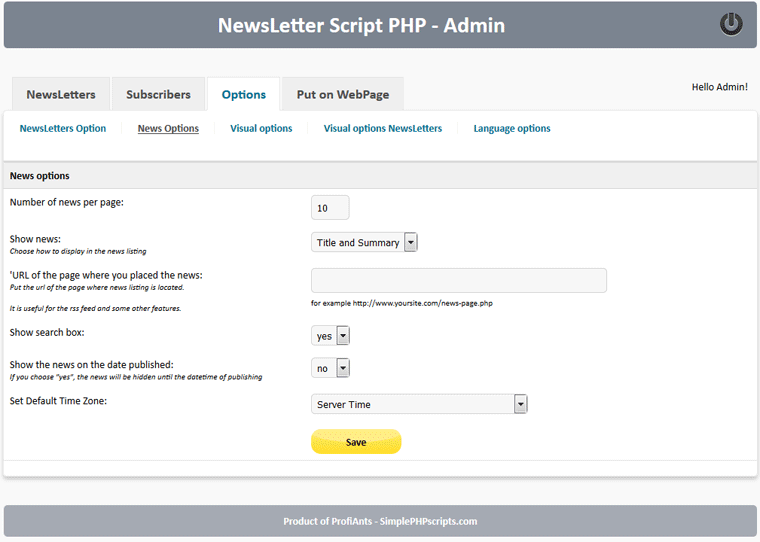 How to put NewsLetter Script PHP on your web page. How to install NewsLetter Script PHP? 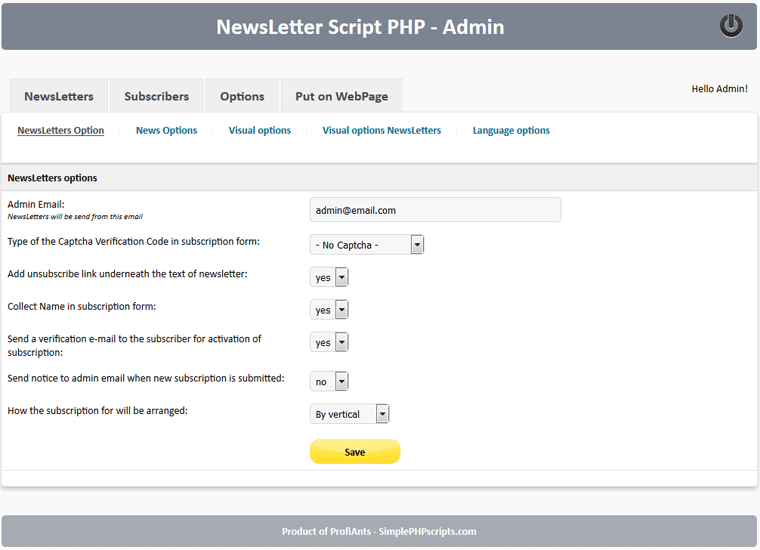 NewsLetter Script PHP requires PHP 5.3 or higher version and MySQL 5.0 or higher version to run on your server - you can see the current version of PHP and MySQL in the control panel of your website. How to use NewsLetter Script PHP? Choose the Status of the newsletter(Published/Hidden). 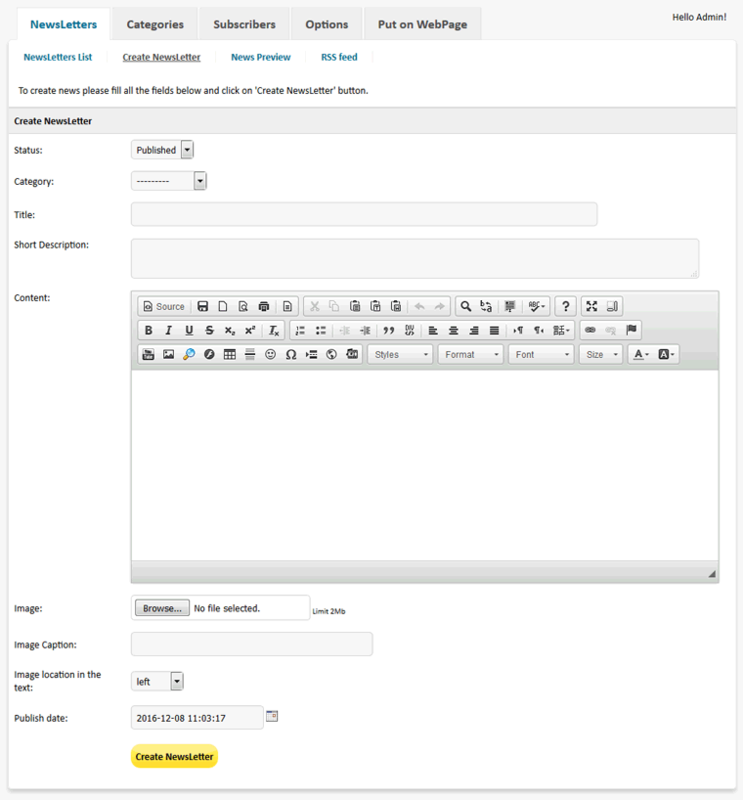 Choose category(previously created in Category menu), then fill the Title, Short Description(it will appear underneath the title in the news grid), Content, Image, and Image caption, choose the location of the image in the article and image width and hit "Create NewsLetter" button. Now we have one article(newsletter) created. You could create as many news as you want and place them on your webpage(see "Put on WebPage" below). 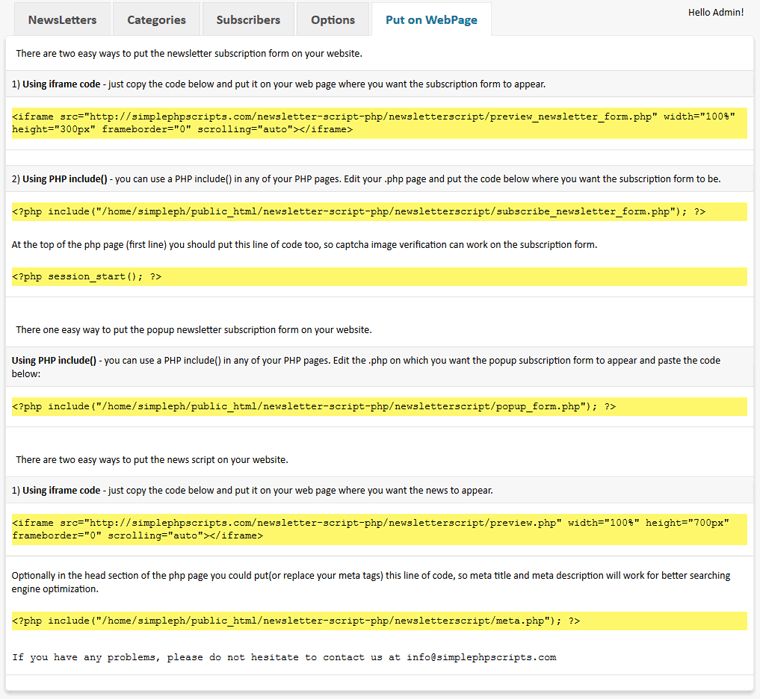 Note that you could use two methods to put the subscription form and the news on your webpage 1) IFRAME; 2) PHP INCLUDE. If your pages are .html or .htm you should use the iframe method. If your pages have .php extension you should use php include to put the codes on your webpage. Of course you could use iframe in .php page as well, but you could not use php include method to place the news or the subscription form on .html or .htm pages, because the php code could not be read from .html or .htm pages. You could open your .html page and save as .php(just change the suffix), then use the php include code. If you use php include you may add meta tags php include code for the news into the head section of your webpage. In this way articles will automatically generate their meta title and meta description and will help SEO optimization for the news page. The popup subscription form could be only php included into a .php page of your website. 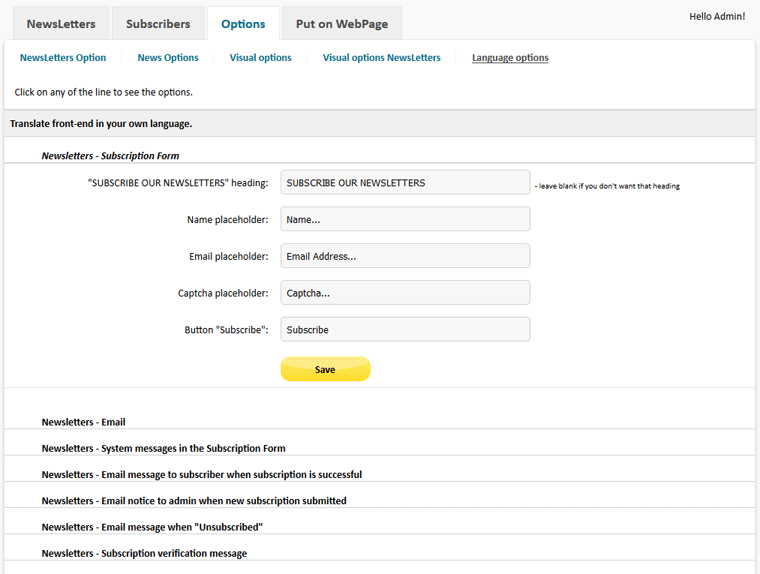 Scroll below to NewsLetter options - how to change from Horizontal to Vertical subscription form. You will see "Edit" button where you could change the status to "active/inactive", correct the email address of the subsciber and change the date of subsciption. Also there is a "DELETE" button where you could delete the subscriber from the list. Note that you could place the code for the news between your header and footer and the news grid will take your webpage layout and will fit your design with your header, footer, fonts, colors etc..., but you will read more about the visibility and visual options at the bottom of this page. Select the emails you want to send the newsletter. Use "Ctrl" key on your keyboard to select more than one email. Choose "All Subscribed Emails" if you want to send the newsletter to all the subscribed emails. Click on the button "Send NewsLetter". You should fill the administrator email. All the newsletters will be send from this email address. Also choose the captcha image for the newsletters subscription form. There is an option to choose without captcha image. Also you could choose whether subsciber to receive unsubscribe link underneath the text of the newsletter or not. If you need the name of subscribers, you should set "Collect Name in subscription form" option to "Yes". When option "Send a verification e-mail to the subscriber for activation of subscription" is set to "yes", the subscriber will receive an email with verification link after submitting the subscription form. If the visitor do not open his email or do not click on that verification link, his subscription will stay inactive and will not receive newsletters. "Send notice to admin email when new subscription is submitted" - if this option is set to "yes", a notice for each new subscription will be send to administrator email. One importand option is "How the subscription form will be arranged" - you could choose the type of the subscription form alignment - Horizontal or Vertical. These options concern the news that you placed on your webpage. Here you could set the number of news per page. 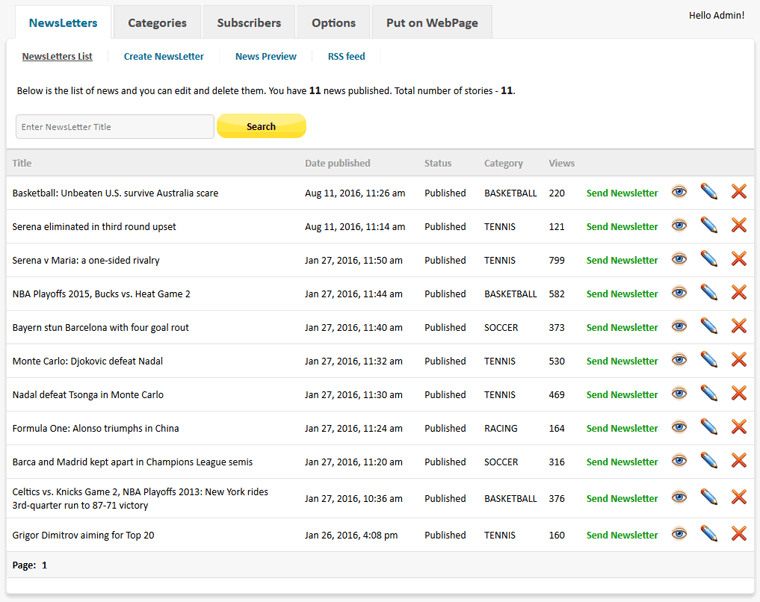 You could choose how to list the news - only titles, titles and summaries, full news in the list. Also there is an option to show/hide the search box above the news. It is a good practice to fill the 'URL of the page where you placed the news' on your website. This URL will be aplied to the RSS feed, so when someone subscribe your rss, the links on the titles of the articles will be linked with your news page. "Show the news on the date published" - on this option if you choose "yes", the news will be hidden until the datetime of publishing. "Set Default Time Zone" - if the server of your website is located in different time zone, you may correct it here. For example if your visitors are European, but the server is in USA, then you may choose your European time zone and time will be corrected. 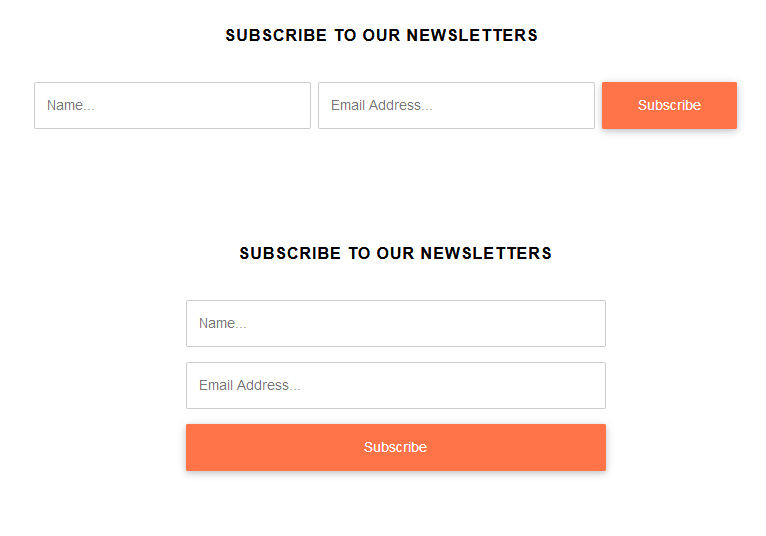 Here you could change the visual style(CSS) of the newsletter subscription form, important settings for popup subscription form and the newsletter title and content in the email with the newsletter. Click on the headings and options will be opened by scrolling down. 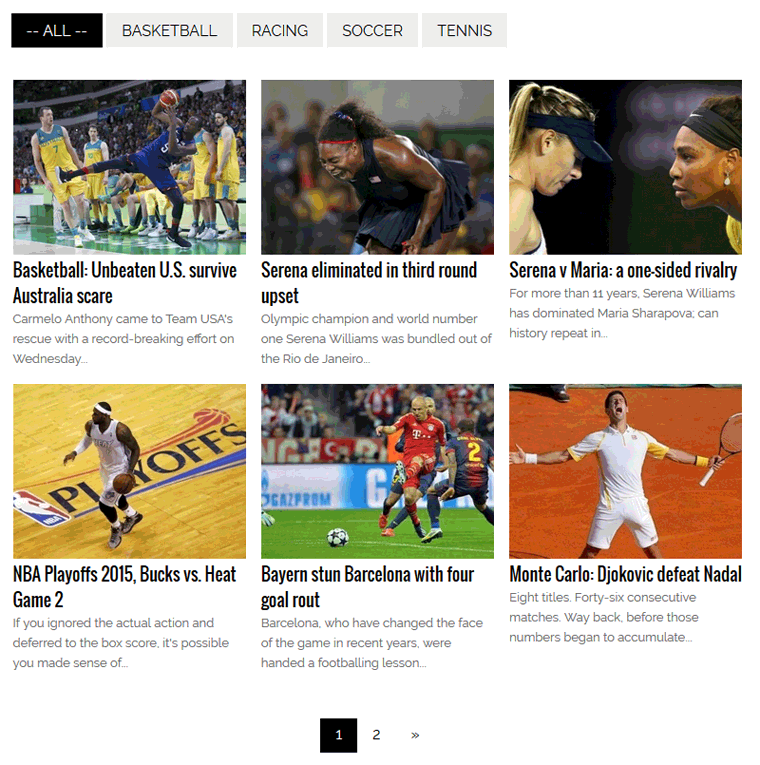 Here you could change the visual style(CSS) of the news that you placed on your webpage. Click on the headings and options will be opened by scrolling down. Here you could translate all the words and sentences of the script front-end in the language you want. 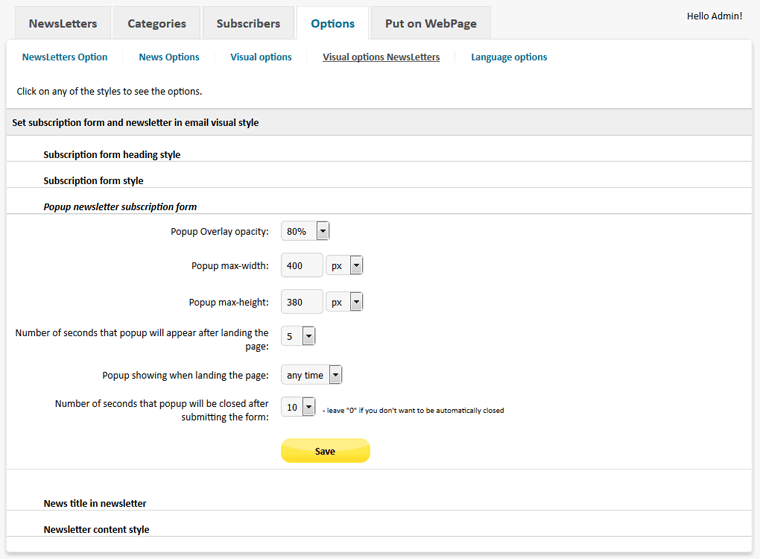 Click on the headings and options will be opened by scrolling down.